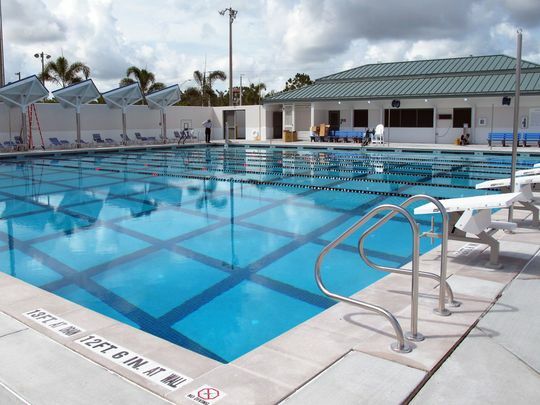 As the latest municipal aquatic amenity to serve the residents of Collier County, the Eagle Lakes Aquatic Facility boasts a diverse offering of pools and water features. The $10 million complex provides families the opportunity to spend quality time together at a facility that offers all the fun and excitement of a water park with a 20-foot-tall slide tower, competition pool, toddler wading pool, and zero-entry family pool complete with splashing play elements. When ADE joined the project team to begin designing the pool complex, our team first identified the community leaders’ vision. While having the fun amenities found at water parks or high-end features from resorts was a key aim of the project, one of the top goals was a focus on programming, specifically swim lessons. 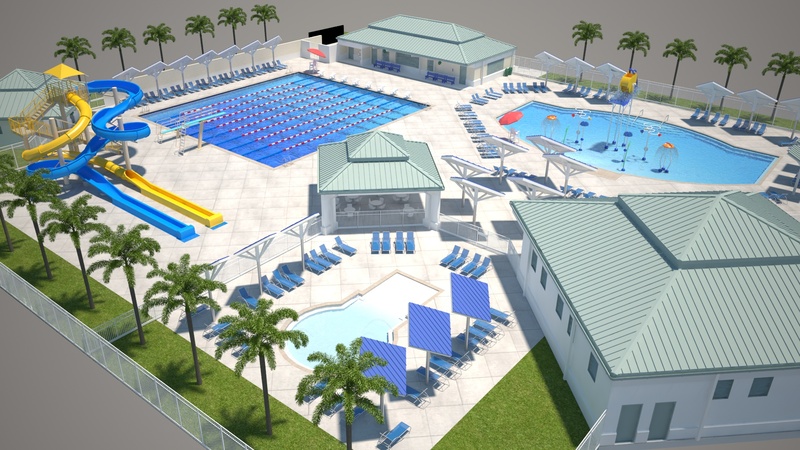 Children’s water safety and drowning prevention are driving factors for Collier County Parks and Recreation, and our plan included specific pool areas that would serve those unique purposes. For the littlest members of the family, an enclosed swimming area with a wading pool provides a friendly introduction to water play. In the main pool deck, the 25 yards by 25 meters heated lap pool was designed for competitive swimming as well as lap swimming and cross use for water aerobics, swim lessons or open swimming on the shallow end of the pool. 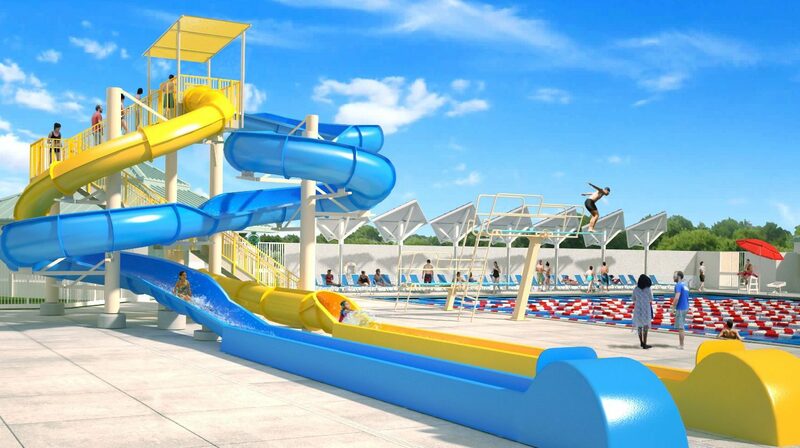 By creating specific bodies of water for fun away from the lap pool, the slide tower and a 4,000-square-foot leisure water park pool centralize family play to these areas, while leaving the other bodies of water available for the needs of the community and their programs. The combination of specialty water features on both the toddler pool and the family pool, the geothermal heating system as part of the lap pool, the UV sterilization and filtration for all the aquatics, and the stainless steel play equipment all combined to make this a unique project with some superior advantages: sustainability, long-term cost-savings, and ease of operation, to name a few. County leaders selected the right engineering choices to be the best stewards of public dollars, and what has resulted is a facility built with the same construction treatments as world-class aquatic centers. Perhaps the best aspect of the Eagle Lakes Aquatic Facility is that there is no way of deciding its best feature for everyone. From the family pool’s tall umbrella features that sprinkle water down, all the way to the spinning dump wheel at the top, kids love splashing around this major centerpiece of the pool deck. For the active adults who participate in a regular water aerobics class in the heated lap pool, it’s their favorite place to socialize. The twin slides give kids and teens the biggest thrills of their whole summer vacation. And for those who will learn the life-saving skill of swimming, simply engaging with water at this facility will be the most transformative of all.